Two years ago we planted our first vegetable garden. It was a wonderful learning experience for B Daddy and me; we got some great yields from our tomato, cucumber and zucchini plants and had zero luck with bell peppers. Last year we really did intend to give it a go again. 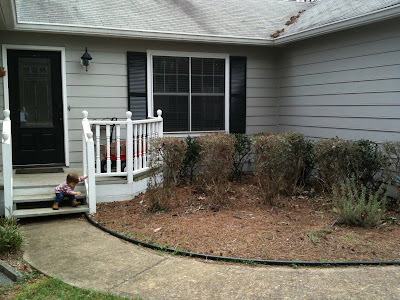 I remember spending a full afternoon moving soil from our compost bin in the back up to the front bed and spreading it around...but then the sad little patch of dirt (right in front of the front door) sat idle all spring, summer and fall. No veggies, no flowers, no effort and no reward. My due date is right around the last frost date for our area, so I've decided the best way to make sure I don't wimp out on planting because of the "I Just Had a Baby" excuse is to start a bunch of plants from seed so I'm already invested in the project by the time Baby L arrives. This idea is totally going to work out...right? I did some Googling around last week (because I know very little about plants in general and even less about seeds) and discovered this gorgeous blog which thoroughly convinced me that starting plants from seed was not only possible but would be an amazingly fun endeavor. So the Squirt and I picked up a Jiffy pellet tray (this thing is genius!) 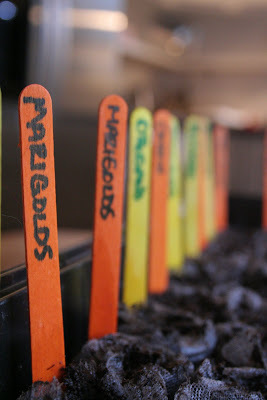 and watered, planted and labeled our little starter seeds earlier this week. This was a GREAT toddler activity. 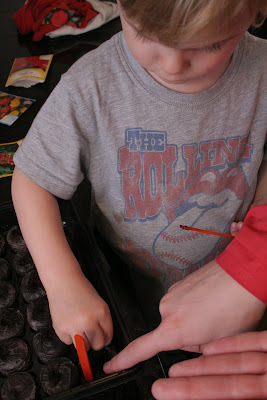 He was pretty good about following directions and putting the seeds into each little pot. I'm really excited for us to get to watch them grow together... the Jiffy directions say to expect shoots in 7-10 days, but I have to admit I check about twice a day. No sprouts yet, but you know I'm gonna keep you posted. Katie, Did I miss something somewhere or did you let it slip? Have you & BJ decided on a baby name? - Baby L? Good luck with the flowers & veggies! I will come to your garden at night and steal all your produce! mwahahaha. May I compliment E on the fine motor skills?